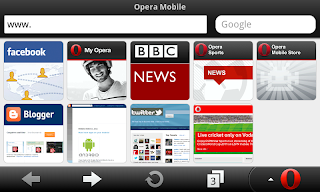 Opera Mobile 11 is a browser that runs on most of the smartphones available in market. It is the only browser that can run on multiple platforms. 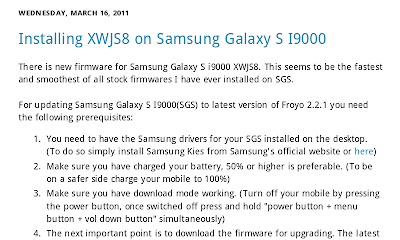 It supports smartphones running Android, Symbian, Maemo and Windows 7 Desktop(Tablets). It is one the best browsers available in market and is absolutely free of cost. 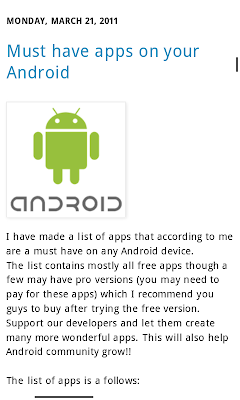 It comes with rich set of features most mobile browsers fail to provide. Opera is known for its browsers and with this latest release of Opera Mobile 11 they have proved their dominance in mobile browsing yet again! 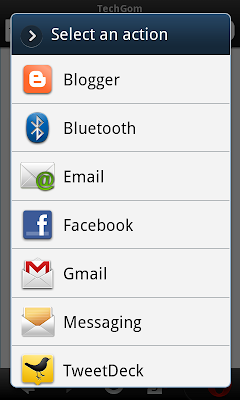 There are certain prominent changes in the UI area for both Opera Mobile 11. The most noticeable thing will be the revamped menu. 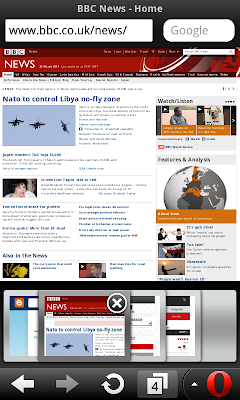 Opera has done a good job clubbing all the features of the browser under one area. The speed dial contains quick links to My Opera, Opera Sports and Opera Mobile Store, you can add your favorite websites for faster access to these sites. The pinch and zoom works perfectly and I was very happy with the results. 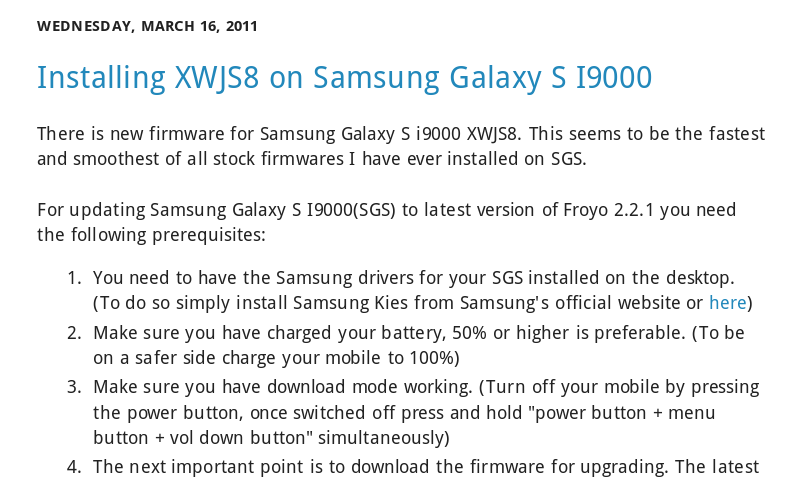 The tabbed browsing remains the same as the previous version. You can open as many tabs as you wish, also I didn't notice any speed different while browsing with multiple tabs open. 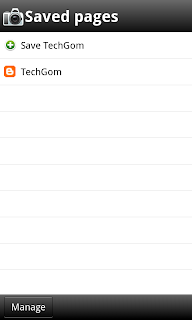 Opera has done a very good job handling tabbed browsing. I like the tab closing feature, clicking on the x it enlarges to confirm if you really want to close the tab and user has to re-click on it to confirm his action. This will prevent accidentally closing tabs while switching between them. 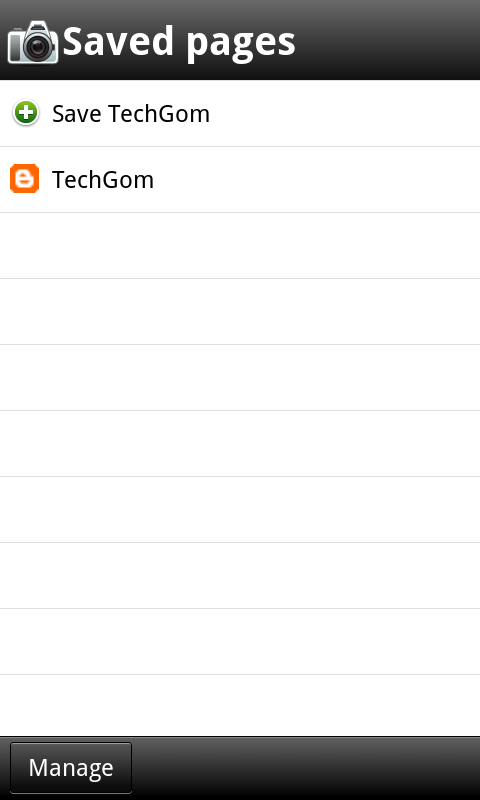 Opera has definitely improved a lot in this department over its previous versions. Opera keeps adding new features with each version while consistently providing an even better performance than previous versions! Opera Mobile 11 now features the same Presto engine. This is the same engine used by Opera for its desktop browser. 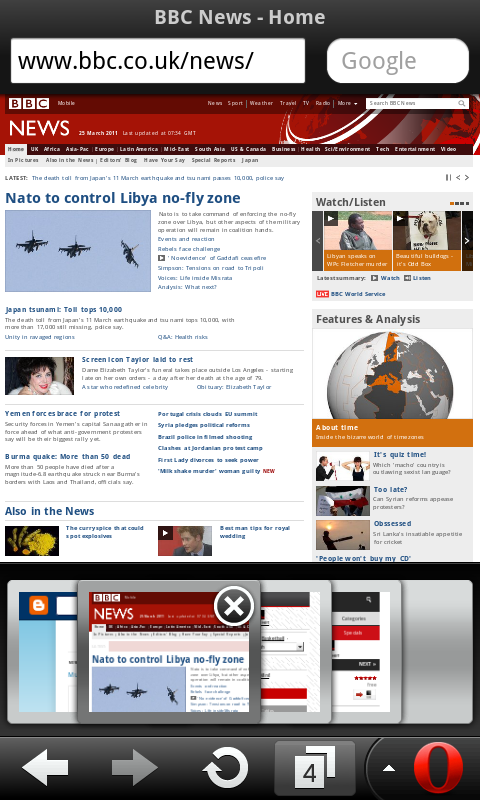 The Presto engine supports HTML5 and CSS3 and is at par with its desktop version. We must really appreciate the fact that Opera is trying to fill the gap between the mobile browsing experience and the desktop drowsing experience. 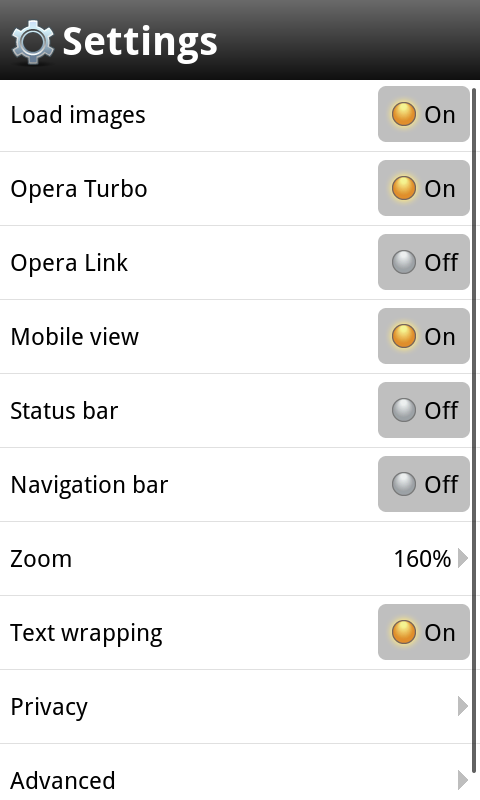 Opera provides Opera Turbo feature which routes the webpages through their turbo severs that optimize the webpages thereby significantly improving performance and thus providing the optimal user experience on your mobile devices. 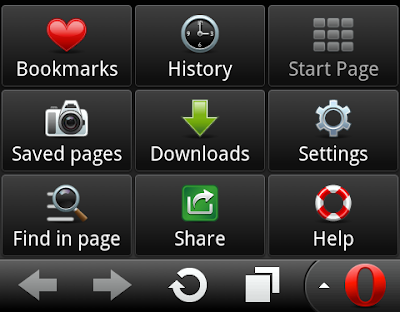 Opera Link is another feature which is a browser sync technology that is native to Opera and allows one to synchronize their browser experience across devices. You need an Opera account, which links your device use the same Opera speed dial entries across desktop and mobile, and ensures that you can access your bookmarks everywhere no matter whether they are created on the mobile or desktop. Opera now provides a download manager that lets you save your favorite webpages so that you can view it offline later on. The text wrap feature on Opera also works pretty well once you zoom any page it will automatically reformat text to fit the screen. 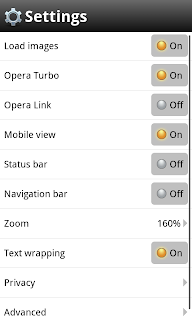 This works effortlessly and is a valuable addition to the rich feature set of Opera Mobile 11. Opera also provides a share option which lets you quickly share your favorite pages with your friends on Facebook, Blogger, Gmail, Twitter. 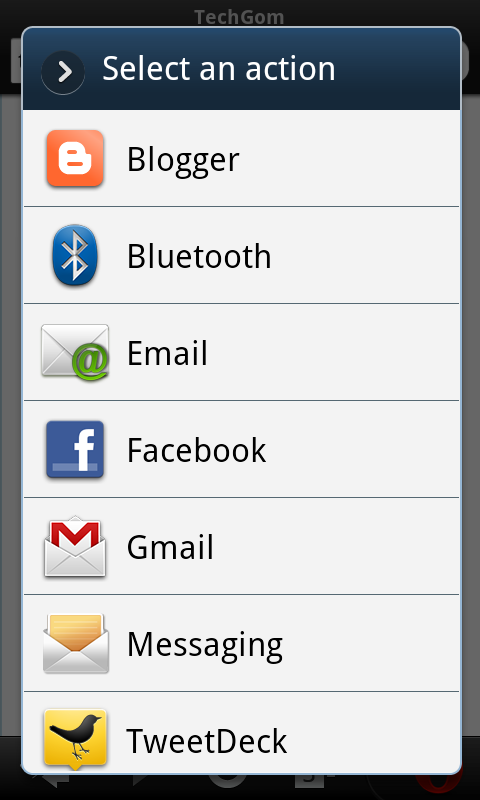 You can also share by SMS or via Bluetooth. Another nice feature that I liked is the Click to play feature. When there is any flash content on the page the browser simply provides a play button disabling the flash content to auto play. Only on clicking on the play button the flash content is enabled. 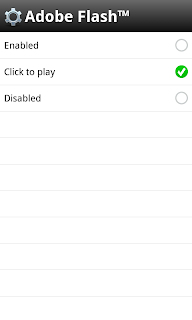 This can be changed from settings in the menu, the other options are disabled and enabled. This is useful when you are on a slow internet connection or on a limited internet connection plan and wish to only read the content. 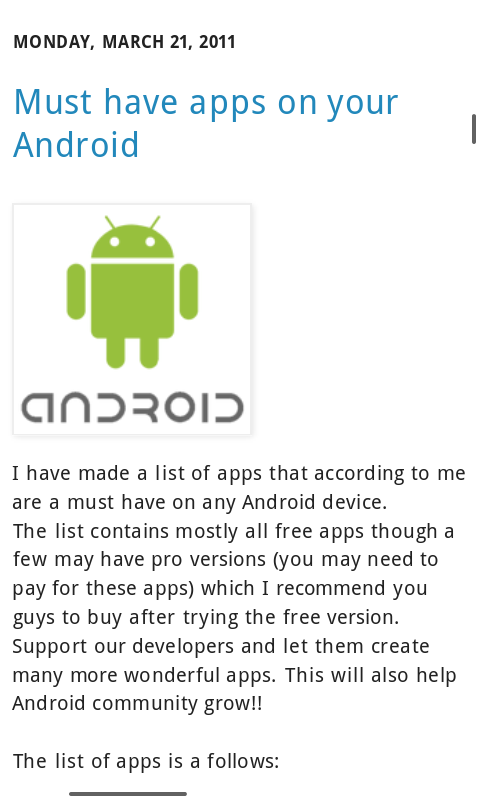 I think this is a very good browser and is one of the best I have used so for on smartphones till date. I like the UI of the Firefox for Android more but it still doesn't support flash so for now Opera Mobile 11 will be my default browser on Android (Samsung Galaxy S).